Hilly Ride from the shop. (30 miles) This is a relatively hilly loop leaving from The Hub Cyclery and heading into the hills East of town. It consists of a nice warm-up down East Cotati Ave. followed by some great narrow, bumpy roads. Make sure you turn left onto Enterprise Road from Sonoma Mountain Road since you want to be descending when you hit Bennett Valley Road. Half Moon Bay Loop. (62 miles) This is an awesome ride from Half Moon Bay up into the hills. It includes Stage Road, one of my favorites, as well as a climb up Old La Honda Road. There are plenty of places to stop for water and snacks along the way. Check out the bakery in the town of Pescadero or Alice’s Restaurant which is on the corner of Hwy. 35 and Hwy. 84. The descent down Tunitas Creek Road is incredible, but you have to watch out for all the cyclist riding up it, luckily a bicycle doesn’t take up much room on the road. A great Wine Country Loop. (40 miles) This is a relatively flat loop leaving from Northern Santa Rosa and heading out into the West County. You will go through the town of Healdsburg and by the Jim Town store if you need water or food. We started the ride from the corner of Old Redwood Hwy. and Mark West Springs Road. Another Wine Country Loop. (55 miles) This is a spectacular loop through Alexander Valley and over Chalk Hill. For the most part it is relatively flat and can be done in either direction. Feel free to stop at the Jim Town store for water and snacks. We started our ride from the corner of Old Redwood Hwy. and Mark West Springs Road. Coleman Valley Loop. (40 miles) What can you say about this ride. Coleman Valley is a BEAUTIFUL road that takes you out to the coast from Occidental. The day I did this loop, I rode from Forestville and met Eric the Fireman in Graton. It is a 40 mile loop if you leave from Graton. Park there and have breakfast at the Willow Wood Cafe. Eric was into heading home over Joy Road, which is very, very steep. You could go straight down Bodega Highway and stop for some bread at the Wildflour Bakery instead if you want, and then head up Bohemian Highway back into Occidental. Dillon Beach Loop. (43 miles) We have been doing this loop for years and years. There are many variations, but the important thing to do is to get yourself out onto those roads. They are old dairy roads that are very, very lightly traveled. The link above is to a ride we did with A1 and his girlfriend on our tandems. We left from The Hub. Another Forestville Loop (33 miles) This is a pretty flat loop from the Berry’s Market in Forestville. You can park at the regional park parking lot right down the street. This loop has very little traffic and you get to ride on some bike paths on the way home. Crane Canyon Loop. (20 miles) This used to be my favorite quick loop that I used to do about 3 or 4 times a week. Now the roads are busier than they used to be. This ride leaves from The Hub also. I recommend going up Crane Canyon so that you can descend with the cars down the backside. Be careful. Best if done on a weekend morning. Old Caz/Willow Creek. (46 miles)This is the loop that is used during the Grasshopper race series. It starts and ends in Occidental. It actually ends at the top of Coleman Valley, but you can just coast from there into Occidental. It is mainly pavement with a couple of good stretches of dirt. Probably best done on a cross bike or mountain bike. Eastside/Westside Ride. (20 miles) This is one of our favorite loops out in Forestville. You can park in the Regional Park parking lot down by Berry’s Market, or down on the corner of River Road and Mirabel Rd. We some times switch the direction of the loop for a change. Sweetwater Loop. (22 miles) We are lucky enough to have this loop right outside our front door. For those of you not so lucky, you can park at Berry’s Forest Hills Market, or across the street at the regional park. This is an awesome loop with a great steep climb and plenty of narrow bumpy roads. We use a shortcut through Rio Nio, but you could ride down to Guerneville before turning onto Armstrong Woods Road. There is a great coffee shop in Guerneville across from the fire station. The Coffee Bazaar is its name. Eureka Canyon Loop. (40 miles) We did this loop when we were camping down south of Santa Cruz at New Brighton State Beach. I pulled Mathilda in the trailer while Claire rode her cross bike. This loop was incredible. The climbing was mostly shaded next to a beautiful creek. There were a couple of busier roads at the beginning, but not too bad. We happened to do it on a 100 degree day, so we were suffering at the end. We actually had someone pull over in her car next to us towards the end and offer us ice water. We got water at a fire station right before dropping down Soquel-San Jose Road. That was one of the best descents we have ever done. The actual link is from May of 2011 and includes a revised way of getting to Eureka Canyon that is much more fun. Roblar/Valley Ford Loop. (24 miles) This is the OLD standby loop from The Hub. There are many variations to this loop. On this day we even did a little loop around Pepper Lane before coming back on Jewitt Rd. Roblar Road is getting busier and busier as time goes on, but it is still the best way to get out towards the coast. Be ready for a stiff headwind on the way out Roblar, but once you turn right, that wind will be at your back. Wine Country Ride. (37 miles) This is one of those rides that people would travel from all over for, but we have it right in our backyard. There are plenty of places to park your car if you don’t want to drive to Forestville, or if you don’t live here. There is a parking lot at the corner of Mirabel Road and River Road, which is free. Bring some money so that you can stop at the Dry Creek Store for a sandwich. Claire’s idea of a great ride. (22 miles) Don’t blame this one on me. A great bike ride for a cross bike, remove your race wheels. 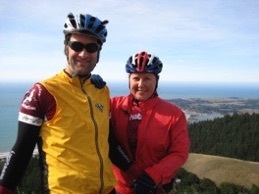 We rode our Ibis Tandem. During the winter you had better be ready to get wet and muddy. Start in Duncans Mills at Gold Coast Coffee and Bakery. Dream Ride. (30 miles) This is one of our favorites that you might have to drive to. There are many variations to this ride, but this is the most basic. We like to park on Olema-Bolenas Road since there are some shady places on the side. The ride starts with a great flat section down Hwy. 1 and through Stinson Beach. If possible, do this ride on a weekday, or try to start on the early side. Take the time to view the ocean on your right as you climb up Shoreline Hwy. out of Stinson Beach. You will then drop down into Muir Woods, watch out for tour busses. Climb back up to Panoramic Hwy. and then climb some more. You will finally turn on Pan Toll Road and climb up to Ridgecrest, where you will be “on top of the world”. This is a fast section, so don’t gaze off to the West too much. Finally you drop down Bolinas-Fairfax Road to your waiting car. Vineyard Loop. (58 miles) We like to do this loop at least a couple of times a year. There are not too many places on this ride where you cannot see vineyards on both sides of the road. Make sure you have some money for a snack at the Jimtown Store, and prepare yourself for Chalk Hill Road after that. You can park at any of the Regional Parks in Forestville, or at the corner of Mirabel Road and River Road. Healdsburg Loop. (40 miles) We were taken on this ride by our friends Bill and Debbie. We parked up on some residential streets, but you could park almost anywhere in Healdsburg and find your way onto the loop. You do get to go by Jimtown Store during the ride so if you need food or water... This loop uses some of the same roads as the Vineyard Loop from above. Here are some of our favorite bike loops. Most of them are in Sonoma County. Some of these rides are off of my Garmin GPS, so you will be sent there when you click on the link. Please be careful out there, and The Hub is not responsible for your safety.